Imogen's Typewriter. 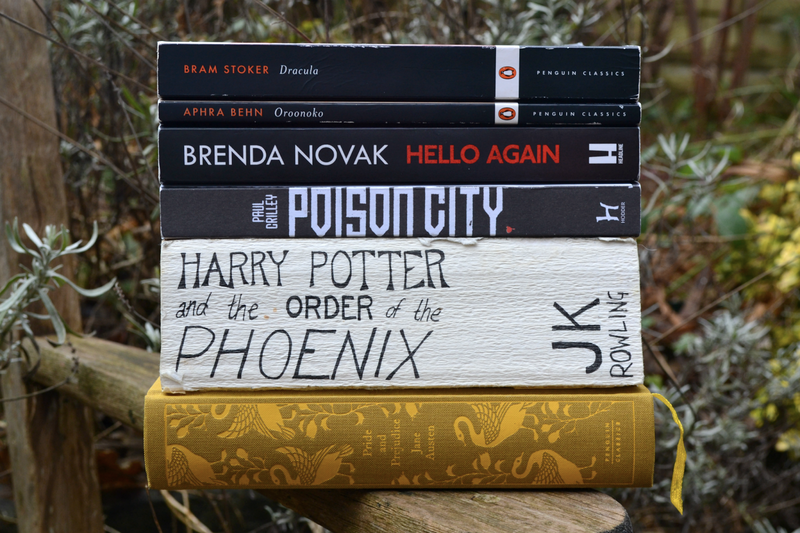 : Books I Read in November & December! Books I Read in November & December! Better late than never! I had a bit of a slow reading month in November as I had a tough essay due on The Duchess of Malfi (which I didn’t completely finish, don’t tell my tutor) and then with another essay planned for the beginning of December on Oronooko- I just didn’t get around to a lot of ‘fun’ reading, despite my Hallowreadathon, a holiday to Mexico and Christmas. So why not put the two together? Oh boy, I had both low expectations and high hopes for this one. Low expectations because every Gothic horror type novel I’ve been reading lately; Frankenstein, Jane Eyre, Dr Jekyll and Mr Hyde, have all been disappointing me. High hopes because, well- I can be an optimist sometimes. Although I didn’t plan to read this during the Hallowreadathon, I started the audiobook on the day and it ended up being the only book I completed in November of the two! But in reality? This was both great and not great. It started out wonderfully, I was spooked to my very core at Jonathan Harker's diary as he spent time in the Count Dracula’s Castle. Everything from then on just didn’t work for me though. There was a lot of repetition with Lucy being sick then Mina being sick, and the methods of actually killing Dracula was a lot more organisation-based and a lot less stabbing through the heart than I hoped for. Plus, despite Mina clearly being the smartest of the bunch, there's a lot of talk about how this is because she has a "man's brain". I know, I know, it's the time but damn. It is possible to compliment a woman without comparing her to a man! I have only the Count to speak with, and he! - I fear I am myself the only living soul within the place. One of my reading goals for 2017 was to only buy one book once I have unhauled ten, and the first ten I unhauled was because I wanted to buy this book and complete my copies of Charlaine Harris’s latest series before I started it! I took it to Corfu, where I read the first two books. I took it to Norway, where it sat unread. And finally in November, I took it to Mexico where this now quite beat-up, at least for me, and the well-travelled book was finally read! And then lost. Anyway, it comes as no surprise to anyone who has watched me read my way through every series Charlaine Harris has written, that I liked it. But it wasn’t my favourite. It just didn’t hold the same vibe that the past book had. The sense of a community wasn’t there for me in the same way as the other books. I haven't watched the TV show yet but that's next on my list. I don't know how much more I can talk about this book after an essay addressing what kinds of narrative techniques are used, what the distinctive features of the language are and how context helps to illuminate my understanding of this goshdarn story. All I will say is that it's an interesting point of view but if I was going to read another book about slavery, it wouldn't be written by a white person. I read the first book in this series in October of last year and really enjoyed it. In fact, my only issue with it was that the main character seemed to flip-flop around with her feelings, but that didn't happen in this book. It was another dramatic plot-based story where a new serial killer is introduced and bad happenings abound. But I will say, I wasn't as hooked. And the writing wasn't great either. I normally have at least one line that I put a sticky-note on because I like how it was written, but nothing stood out in Hello Again. I'll continue the series but- we'll see. Are there other series focusing on serial killers from a psychology point of view? I had wanted to read Poison City for a while before I eventually did. I've been in a real mood for some urban fantasy and this; an occult investigator in South Africa fits the bill. Straight away there's some casual ableism in the use of 'schizophrenic' to describe a mix of colours and impressions in the city he lives in. I'm getting really tired of finding this in books that are recently published and should know better. I'm probably not going to pick up the next book. I loved the idea of this and I enjoyed it well enough when I read it, but I know there are other urban fantasy series out there that will blow me away. -dawn eventually clambered into my room and told me to give up even trying to close my eyes. It's official. This is my least favourite Harry Potter book. I had a crisis when the Goblet of Fire wasn't as good as I remembered but oh boy- this one. The ableism continues; within one page Harry is called a 'crackpot', 'potty', 'barking', 'mad', and that was one instance of many. Not to mention the uncomfortable treatment of Lockheart at St. Mungos. And as for length, I couldn't tell you what happened in the middle of this one. I remember quite vividly, sitting at my desk just after finishing it and feeling like I might have missed a huge chunk, despite listening to the full 30-hour long audiobook. I miss the tightly packed 300 pages of books 1-3. This didn't need 766 pages at all. Luckily, book 6 cut this down but this was a rough going. "And from now on, I don't care if my tea-leaves spell die, Ron, die- I'm just chucking them in the bin where they belong." Pride and Prejudice by Jane AustenAnother Austen read! I liked this one only a little bit more than Emma, which I read back in July and found charming. I don't think either is my 'favourite Austen' though. There's not much I can add to the many opinions of this book! I listened to this over Christmas and was surprised at how quickly I sped through. Jane Austen's wit and views had more opportunity to shine in Pride and Prejudice and I can see why it's Kathleen Kelly's favourite book (from my favourite movie: You've Got Mail). My one issue was that while Mr Darcy seemed to learn his lesson about Pride, Elizabeth just seems to switch to being really judgemental of her family. I would've liked if that forgiveness could've stretched a little more. "- You shall not, for the sake of one individual, change the meaning of principle and integrity-"
What did you read at the end of last year? Book Review: Catch-22 by Joseph Heller!